Cladex have the necessary cutting equipment’s to cover any need of our customers. All the laser models have been acquired with criteria of quality and efficiency, and include all the technological advances to guarantee a fast, precise and a maximum quality production. Minimal Imperfections: Laser cutting processes produce smooth cutting areas, minimal burrs or other imperfections. The process also results in minimal heat distortion and material warping. By eliminating such imperfections, operators reduce the need for secondary operation on the part. High-Precision Cutting: Laser cutting typically holds a tolerance of +/- .005, making it a highly precise cutting method. This high cut precision reduces the need for secondary operation on the part, as well as part scrapping. 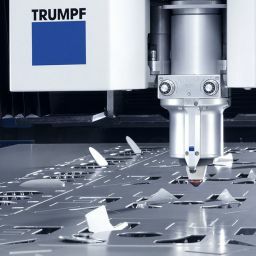 Quick Turnaround: With reduced tooling requirements and minimal secondary operation, laser cutting allows for much quick turnaround times on most jobs. Broad Material Capabilities: Custom laser cutting can produce nearly any two-dimensional shape, increasing the possibilities of production. The types of metals that can be cut using commercial laser cutting services further expand these capabilities — steel, aluminum and stainless steel laser cutting services are the most common, but non-ferrous metals like copper, brass and bronze are also compatible.